The golfing legend is aiming to roll back the years this week at Augusta. Tiger Woods took his first steps towards a first major in eleven years but faces stiff competition from a whole host of players after a tight opening day under beautiful weather conditions at Augusta National. 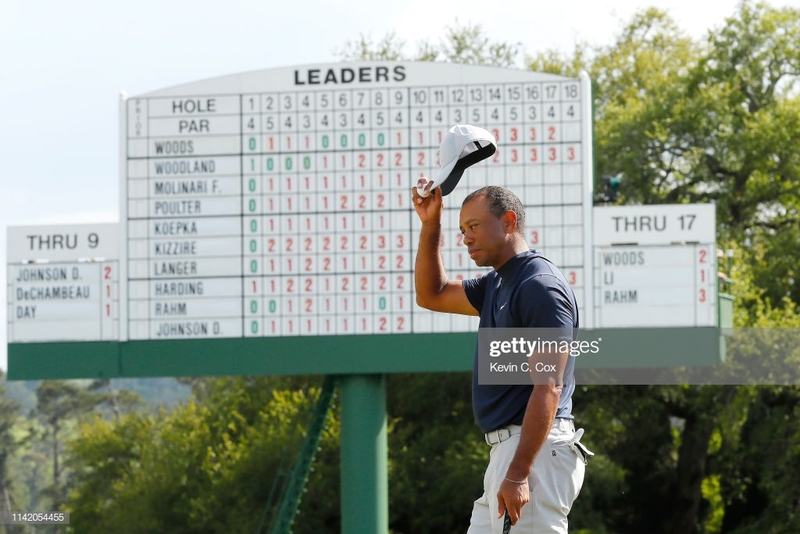 On a day when his compatriots Brooks Koepka and Bryson DeChambeau ended the opening 18 holes at the top of the leaderboard, Woods still has a great opportunity to create even more history at the age of 43, albeit from four shots behind. Woods, 14 times a major champion with four Masters trophies to his name, finished a steady opening round on two under par, one shot behind the leaders at the time. Despite not winning this particular tournament since 2005, Woods strutted around the course as if he was playing a decade previous. Only a bogey on 17 dented a solid round but he finished well after landing in the bunker on the final hole. Woods was playing alongside Jon Rahm, another leading contender, who put an inconsistent opening nine behind him to steady the ship and end his opening round at the top of the leaderboard on three under par. As is often the case in The Masters, several unfamiliar names also found themselves in the red. South Africa’s Justin Harding hit the ground running with an early three under, whilst the first eagle of the week dropped for Patton Kizzire to help him up to the same score before losing a shot on the final hole of his round. Adam Scott formulated a flying finish to also record a tie for the lead but almost a quarter of the field were separated by just a single shot at one stage in the afternoon, all looking to hunt down and/or bypass the Tiger as a yardstick. Another of the contenders, Rickie Fowler, made a positive recovery to finish two under, perhaps suffering from the ‘early nerves’ he mentioned a day previous on the driving range. However, there was a much stronger start to the round for Dustin Johnson which seemed to propel the late finishers into life. As the sun began to drop, several players from the home nation started to flood the top of the leaderboard. Johnson was one of four Americans to tie for the lead on three under within the space of ten minutes. Kevin Kisner, Bryson DeChambeau and Brooks Koepka all staking a claim for the overall advantage on day one. However, they were quickly joined by two surprise packages - Ian Poulter, partially making up for a poor day for the English hopefuls and Thailand’s Kiradech Aphibarnrat - a nine-way tie for the lead with everyone within the final six holes. If the capacity Augusta crowd thought they had been treated by what had gone before, then they were about to be catalysed by the icing on the cake. Koepka scored three birdies in the next four holes, racing to the top of the leaderboard on six under. Poulter looked to keep pace, dropping to four under, as did Johnson later in his round. But it was DeChambeau who provided the champagne finish, ending his round with four birdies to join Koepka on six under. Meanwhile, Augusta legend Phil Michelson, now 48, stormed to a grandstand finish of five under after previously dropping in the water at the turn after a strong start to the round. All of a sudden, Woods’ roar looked to be more of a purr. Yet it was a difficult opening day for several of the bigger names. Reigning champion Patrick Reed is already seven shots off the lead, as is pre-tournament favourite Rory McIlory who saw six bogeys outweigh his five birdies. Legacies carry very little weighting at Augusta as former champion Sergio Garcia found out last year. This time it was the turns of World number one Justin Rose and regular Masters’ performer Jordan Spieth to suffer at the hands of the unforgiving course. Both players carded four over par on the front nine before pulling back just one shot each. Meanwhile, Jason Day had struggles of a different kind, hampered with a back injury that limited him to two under par but still very much in the running - along with a large chunk of the entire field.